An Orthodontist, like Dr. Birth, Dr. Stewart, and Dr. Fletcher, is a specialist in teeth and jaw alignment. They study the art of straightening teeth after dental school. 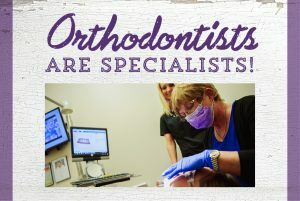 Orthodontic specialists have learned how to move your teeth to where they are not only straight, but also fit within your jaw alignment and facial structure. Orthodontics, by braces or Invisalign, is truly an art that calls for a defined skill. Dr. Birth and Dr. Fletcher are also both Board Certified which means that they have completed rigorous studying for examinations by the American Board of Orthodontics. They were both required to complete a written exam, present patient cases, and complete an oral exam. To continue their Board Certification, your doctors must take recertification exams periodically. Orthodontics by Drs. Birth, Stewart & Fletcher is dedicated to providing you with quality care and treatment. Call us today for a complimentary consultation!